Almost a year after conservationists sent out a plea to help save a species of Bolivian aquatic frog by finding a mate for the last remaining member, Romeo, his very own Juliet has been tracked down deep inside a cloud forest. Not only did the wildlife conservation team return with a potential mate for Romeo, who had been 10 years a bachelor, but also another four members of the Sehuencas water frog species, boosting hopes to save the tiny amphibians from extinction. After previous failed expeditions to the same area over the last decade, a joint expedition between Global Wildlife Conservation (GWC) and the Alcide d’Orbigny Natural History museum finally scored a success in the Bolivian wilderness. And the good news came about after securing funding following a Valentine’s Day appeal last year to help find Romeo his Juliet. “It is an incredible feeling to know that thanks to everyone who believes in true love and donated for Valentine’s Day last year, we have already found a mate for Romeo and can establish a conservation breeding program with more than a single pair,” said Teresa Camacho, the museum’s chief of herpetology and the expedition leader. Romeo had been found in that same cloud forest a decade ago and it was feared that he was the last survivor in his species. With a lifespan of 15 years, time was running out to find Romeo a mate to ensure the survival of the species, although the frog himself never gave up hope, continuing to call out for a mate during his 10 years in captivity. “Now the real work begins: We know how to successfully care for this species in captivity, but now we will learn about its reproduction, while also getting back into the field to better understand if any more frogs may be left and if so, how many, where they are, and more about the threats they face,” added Camacho. The group of frogs has been placed in quarantine at the museum’s K’ayra Center for Research and Conservation of Threatened Amphibians of Bolivia to help them acclimate to an environment that replicates the conditions they would face in the wild. 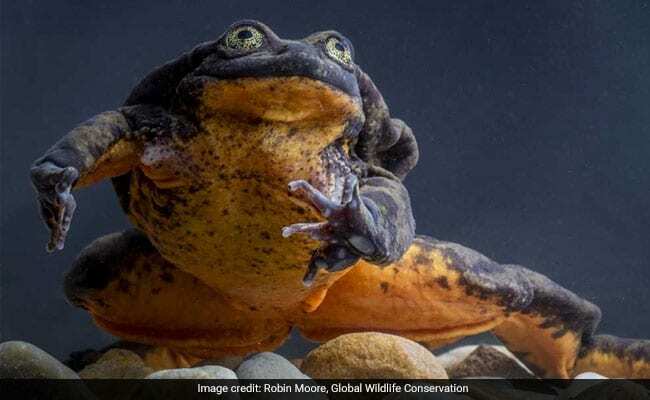 “They will also be treated for the deadly infectious disease chytridiomycosis, which is partly responsible for the steep decline of this species and other amphibians in streams where they were once found,” said GWC. Only then will Romeo meet his Juliet. The priority now is to ensure that Juliet, who measures 55 millimeters (2.2 inches), makes a good impression on her beau, who is brown with dark spots and slightly larger at 62 millimeters. “We want to ensure the perfect conditions for his blind date,” an excited Camacho told AFP. Reproduction is the primary goal, but Camacho says the team is in no hurry. Either way, the conservationists couldn’t simply sit back and do nothing, said GWC’s Central America and Tropical Andes coordinator Chris Jordan. “There is always risk in bringing animals in from the wild to build an insurance population, and it isn’t a step that should be taken lightly,” he said. Given the success of last year’s Valentine’s Day appeal, when $25,000 was raised to help fund expeditions into the forests, conservationists have decided to make February 14 the day of Romeo’s blind date with Juliet. The money allowed the researchers to organize eight expeditions of between one week and 10 days to the area where Juliet was found. Four of those have now been completed, while the remaining expeditions will branch out into other areas. GWC says the Sehuencas frog, which is completely aquatic, was once found in abundance at the bottom of small streams and rivers or in ponds deep inside mountain forests.